In this fast-paced, instructional video from Championship Productions, Coach Donnie Jones shares the strategies that laid the groundwork for Florida's back-to-back national title runs. Coach Jones takes viewers through the seven build-up drills and 12 sets that form the core of his up-tempo offense, focusing on fundamentals-passing, catching, talking, shooting and dribbling-as the key to improving play and putting points on the board. Using strategies termed "beginnings " and "endings," Coach Jones demonstrates how to push the ball up-court for a quick score ("beginnings) and how to reset the offense after a missed shot (endings). 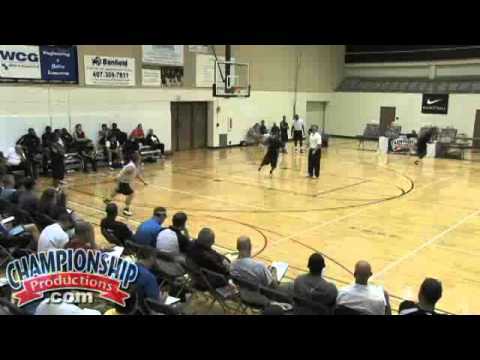 His detailed discussions of various "pick and roll" options, which is his primary transition offense, emphasize the correct use of screens, spacing and positioning. He also demonstrates several different versions of the primary pick and roll, which can be used to break an opponent's defensive tempo. Coach Jones also shares his "musts to winning'-great defense, unselfish ball handling, playing hard, effective rebounding and mental/physical toughness. A unique component of the video is a question and answer period at the end of the instructional portion of Coach Jones' presentation. Learn even more about implementing this results-oriented offense from the answers Coach Jones gives to tough questions from his audience. Produced at the Fall 2010 Orlando (FL) clinic.